Many people have visited the website, People of Walmart. No matter how often I look at it, it still puts me in shock at the things people do and wear. Today, I just wanted to share my Walmart experience. Now if you haven’t noticed already, this girl has hot pink pants on with a hole in the knee. However, look a bit closer. She is also walking around with NO shoes on! Apparently the rule, “no shoes, no shirt, no service,” does not apply to her. Both her, her dad, my friend and I were doing the “zig zag” thing through all the grocery isles. It wasn’t until half way through the grocery section that I noticed. She was acting like “hot stuff” since there was a cute guy in a few of the isles with us too. Then I looked down. My first thought is, “That is absolutely disgusting.” Who in their right mind even feels comfortable walking around a store like that? I feel awkward when I’m in a SHOE STORE walking around with one shoe on and one shoe off. 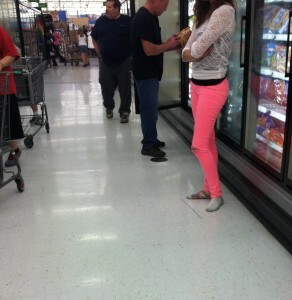 I’m sorry hot-pink-pants girl, this is trashy and gross. If that cute guy did notice you, he was defiantly turned him off with your fashion statement. I have a very hard time believing you do not have a single pair of shoes to put on at this moment. Congratulations though, you have officially made the People of Walmart! !